In the First Afghan War (1839-42), the British Army of the Indus marched on Kabul, the capital of Afghanistan, to establish a satellite kingdom. While initially victorious, the British and Indian force became trapped in Kabul by an uprising. Attempting to retreat back to India, the Army of the Indus was destroyed by the Afghans. 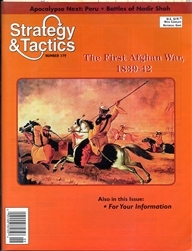 The game includes two scenarios; March to Kabul and Rebellion & Retribution. 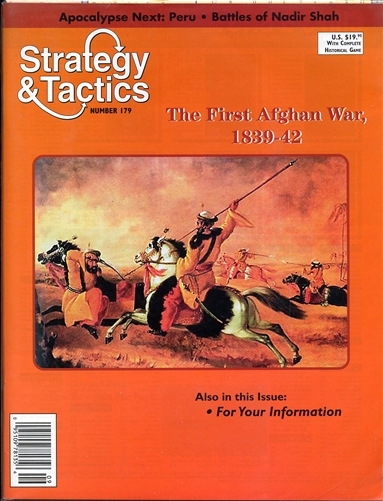 First Afghan War demonstrates the significant features of warfare in this era, including the great variety in weapons types, the importance of supply, leadership and the meddling of the Home Office. Players must use organizational as well as tactical capabilities to win. The game uses the same system as Sun Never Sets ("Campaigns of the British Empire") and French Foreign Legion (S&T #200).